These days, Dallas is not exactly known as a tennis hotspot. It hosts a Challenger Tour event, but it rarely attracts much attention, particularly for a first round match between a Ukrainian and an Argentine. However, that is precisely where the attention of Twitter was focused on Monday evening. The match in question was between Denys Molchanov and Agustin Velotti. For this article, we shall focus on Denys Molchanov, a Ukrainian ranked at 174 in the ATP rankings with career prize money of just over $310,000. The tournament in Dallas has prize money of $14,400 for the champion, but a first round defeat earns a player just $1,040. Let us begin by looking at the pre-match markets. 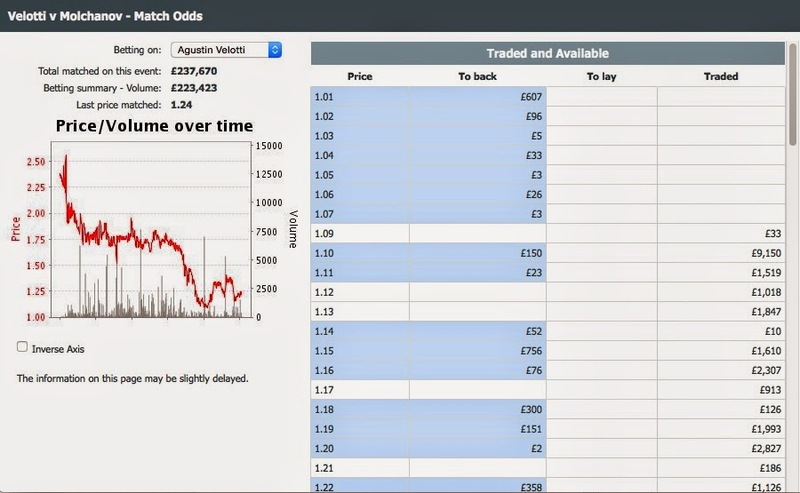 The image below shows the odds movements by Pinnacle, usually regarded as the most reliable bookmaker. We can see that Denys Molchanov opened at 1.63 in the early hours of Monday morning. These odds give an implied probability of 61.3% of winning the match. As we can see, there was a slight drift on Molchanov as the day progressed, but nothing out of the ordinary. When the market closed at 19:56 on Monday evening, Molchanov was 1.77 to win or 56.5%. Nothing unusual here. The first concern was raised in a tennis chatroom with someone questioning why Molchanov was as big as 2.36 and why the market appeared not to be moving. When Denys Molchanov clinched the first break and Agustin Velotti's price continued to shorten, further questions began to be asked. At 5-3 down in the opening set, the price on Agustin Velotti was as short as it had been throughout the entire match. Despite being broken serving for the set, Molchanov immediately broke back and with the second chance to serve for the set, the price on Agustin Velotti continued to fall. 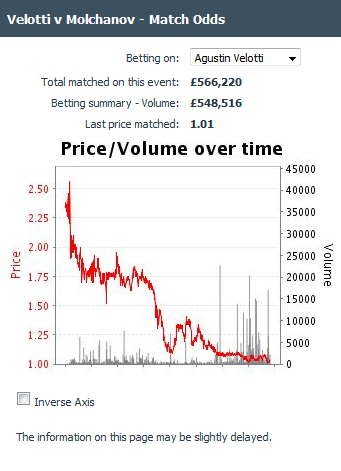 Having been priced as 48.3% chance to win the match at the start, he was now priced as a 75.2% chance of winning the match, despite being down a break and potentially about to lose the opening set of the match. In other words, Velotti was apparently significantly more likely to win the match at this point than he was at the start. 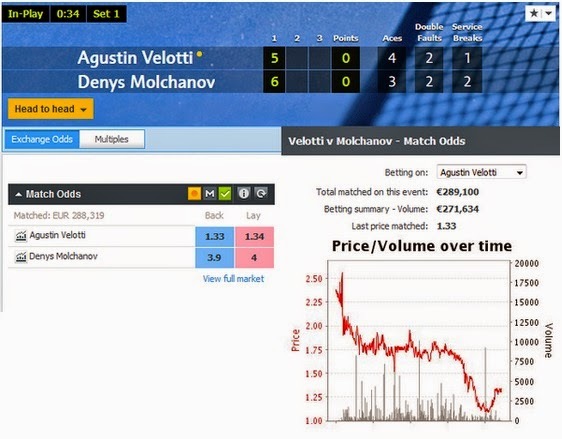 Denys Molchanov successful served out the opening set and Velotti's price continued to drop. Now, you do not need any understanding of betting and odds to understand that a player that was given a 48.3% chance of winning a tennis match before the start should not be given a 80.6% chance of winning a match at a set down, unless there is something suspicious going on. If you like a fixing story, ones taking place now. 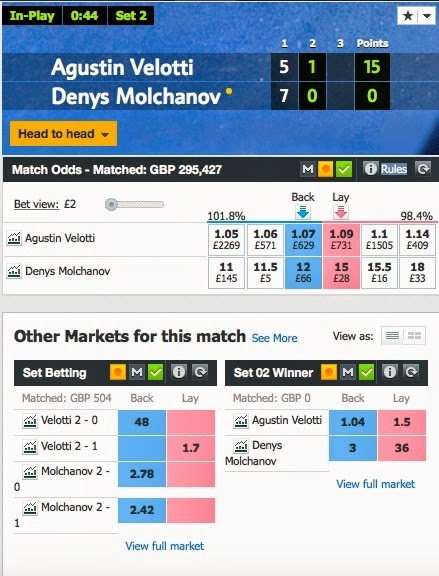 Velotti underdog to Molchanov, loses first set and £200k hits market. 2-1 velotti? By this time, there was already close to £250k staked on the match - a surprisingly high amount for a Challenger match. We can see as well that Agustin Velotti had already been matched at 1.09 or a 91.7% chance of winning the match, despite starting the match as the outsider and never having been ahead in the match. A hold of serve later and the money continued to pile in on Agustin Velotti. He was now 93.5% to win the match, despite being down a set. Under normal circumstances, we would expect Velotti to have roughly about a 20% chance of winning the match from this point. We can also see that there is money looking to back Velotti at 1.5 to win the second set. Agustin Velotti went up a break in the second set and by this time, there was little doubt as to what was happening. The prices in the market were no longer reflecting anything to do with what was happening in the match. We can see the money lining up in the market on Velotti and we can also see that his price is exactly the same as it was after the opening hold in the set. One might suggest that someone already knew that the break would happen. In fact, one might suggest that someone knew precisely how the match would end. Agustin Velotti went on to win the second set and after a brief pretense at putting up a fight in the opening stages of the third set, Molchanov duly gave up a break in the third. By this point, Velotti was guaranteed to win according to the market. The farcical nature of what the match had become was perfectly summed up in this glorious point. There was little effort from Molchanov to get back into the match, as demonstrated by the fact that he won just five points on the Velotti serve in the final set, one of which came through a Velotti double fault. By the end of the match, there was close to £600k matched on the Betfair match winner market - a large amount for a Challenger match. Indeed, it was more money matched than on the infamous Antal van der Duim and Boy Westerhof match last year (article here). Agustin Velotti had begun the match as the outsider, but had steadily shortened in the markets, independently of what was actually taking place in the match itself. It was as though someone knew from the very start that there was no chance of Denys Molchanov winning the match. Now, I should stress that there appears to be no suggestion that Agustin Velotti had anything to do with any of the suspicious odds movements that took place in this match. He appeared to be playing his match normally, acting normally, although there were suggestions that he looked a little confused as the match progressed. People watching the live stream of the match reported that there was a number of very strange errors being made by Molchanov off very simple shots and it is understandable that Velotti might have been puzzled by what was happening to his opponent. However, it is tough not to suspect Denys Molchanov in this situation. The odds movements in the match simply cannot be explained. With a narrow favourite, that player becoming a slight outsider as the opening set progressed is plausible depending on how the players were performing. However, a narrow favourite becoming a huge outsider while ahead in the set and having won the opening set is simply not possible. 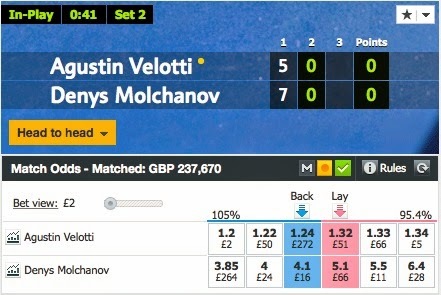 On Betfair, the only possible scenario in which these odds movements might happen was if there was a major injury to Molchanov and the market expected an imminent retirement. However, this simply was not the case. The only hint of any possible injury was Molchanov clutching his leg during the second set, but there was no indication of any serious injury and the odds were already way out of line long before this. The link above shows the full match for anyone that may be interested in following the action. Now that we have shown the odds movements for this match, you can see whether there was anything in the match to suggest that the strange movements may have been justified. Despite all the evidence in the markets, chances are that nothing will be done. The infamous Meersbusch match last year has so far led to nothing and there is not even any indication that the match is being investigated. However, all we can do is to flag up these matches in the hopes that eventually something might be done. To finish, I will simply copy and paste the final paragraph from my previous article on this topic. It felt relevant then and it seems just as pertinent now. If no action or investigation is launched, many fans will lose what little faith remains in the authorities to combat the growing spectre of match-fixing in the sport. For the ATP and the TIU, the ball is now in their court. Do they have a response? There is now an interview with Agustin Velotti where he is asked whether he had any suspicions about the match. He emphasises that he played no part in any questionable activities involving the match. I agree with him in that there did not appear to be any suspicion surrounding his involvement in any potential fix in this match. As far as I am concerned, he would appear to be an innocent bystander that was caught up in this. The full interview with Agustin Velotti, conducted by Raul de Kemmeter is available here. I didn't fix, I promise! Oh nonsense. My brother would never do anything to question the integrity of such an HONEST sport. A fix in pro tennis? Sheesh what's next NBA refs fixing games? Malarkey. Meanwhile you should all disregard the few months my brother is going to take off from the sport... Also disregard the money he has seemingly come into out of no where. A very good article. It is 100% certain that the match was fixed. However, how do you prove it? Without someone who was involved coming forward with information (which seems very unlikely at present, if ever!) then all Molchanov has to is deny any knowledge, which I believe he has already done. And will no doubt do so again if the TIU or any other body question him. The simple point is, if you don't want to risk your money on (with all due respect to the players at this level) a tinpot match in the middle of nowhere watched by 2 men and a dog, simply don't bet on it. Caveat emptor I'm afraid. When the prize money does not even cover the players expenses for taking part, this can always happen. Not saying for a second this justifies fixing a game, it obviously doesn't. But that's the reality of the situation. It's also wrong to expect bookmakers or exchanges to start voiding bets. Then you go down an extremely slippery slope where they can act in their own interests depending on their position in the match. Again, if you bet on these sort of games that is a risk you (and they) decide to take. Unless the governing body comes out and says that it was fixed, it is unrealistic, even naive to think that is a fair solution. The amount of money bet on the match seems to be larger than the purse for the entire tournament. Seems like it's potentially more profitable to bet on tennis than it is to play it. And that's likely the problem. This, kids, is why you shouldn't gamble. And how foolish all those who believe that fixing goes on only at the challenger level. When u have bet-at-i-dont-know-where (home, couch, living-room) being the main sponsor of a tennis tournament, u think they ll let the matches untouched? think again..